International House was designed by Tzannes architects and built by Lendlease, with PEFC-certified cross laminated timber (CLT) supplied by the Austrian company Stora Enso. Glulam was also used in the building. The prize was announced at a gala dinner in Amsterdam attended by more than 1000 people. Dedicated to celebrating outstanding architecture, the World Architecture Festival awards prizes in various categories. This year, PEFC and WAF awarded the Best Use of Certified Timber Prize for the first time. The prize recognises architects and project teams for their use of certified timber as a main construction material for buildings outstanding in sustainability, innovation, quality or aesthetics. A total of 40 architects from 20 countries entered their projects in this category. International House is an entry point to Sydney’s major new development, the Barangaroo precinct, which hosts thousands of visitors daily. 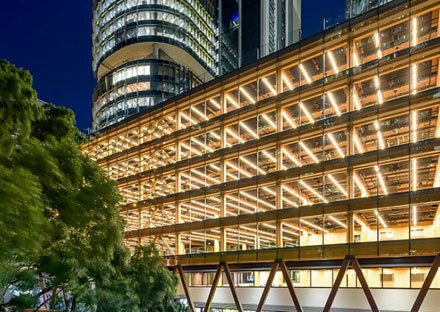 The commercial building catches the eye; the ‘clear glass skin’ reveals the multi-storey timber structure that forms the character of the architecture. A striking colonnade of hardwood columns fronts the street. The ground floor is concrete, but above that, all the floors are CLT. The cores such as lifts are also CLT, while the columns and beams are Glulam and exposed around the lifts. Raking columns are made of hardwood Ironbark timber reclaimed from old bridges. The designer, Alec Tzannes, said he aimed to create a new form of beauty beyond shape and surface. “It is ‘deep design’, renewing architecture’s role to serve the greater social purpose of lowering carbon emissions,” he said. The building sets new standards in sustainable construction and operation. 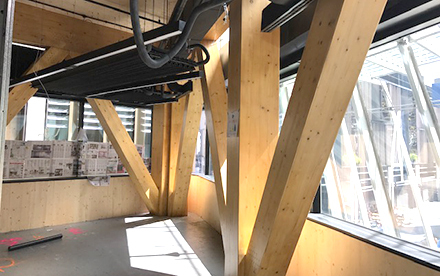 The certified timber stores large amounts of carbon in its fabric, while the adjacent harbour cools the building through modern heat exchange technology. Photovoltaic panels on the roof generate renewable energy. The use of prefabricated timber also reduced waste by 25% compared with a conventional building. It’s also good for the people working in the building. Tzannes director Jonathan Evans said timber had a very strong effect on humans, both psychologically and physically. “We respond to the warmth of the timber, the character, the natural heritage of the material. It lowers our blood pressure and heart rate, and improves our cognitive ability,” he said. Mark Thomson, architect and member of the WAF jury, said the variety and geographic diversity of the projects entered in the prize verified that certified wood was a growing global trend. “The PEFC certification provided confidence to architects that sustainability issues were correctly addressed in their projects,” he said. The World Architecture Festival was first held in 2008. The first four festivals were held in Barcelona, but since 2012, the annual events have been hosted by Singapore, Berlin and Amsterdam.